The Tarr has been my musical companion since 1989. A friend of mine had the Raymond Elgar books on double basses, and had bought one of the instruments from Elgar in the 1980s. I contacted Mr Elgar, and asked if he had any books left (as they were out of print at the time) and enquired whether he had any basses for sale back in 1987. The answer was yes, and yes - the latter being the Baker in the book. Elgar was a bit of an amatuer repairer - he told me the Baker had worm, but he had fixed it. I got to Hastings to find bit of his dinning table stuck into the corners of the back and the varnish still wet!! I should have bought the bass as he only wanted £4000 for it - knowing what I know now I would have taken the bass and had the work done properly. But I was in my 20s and a bit green, so I asked if he had any others. He did, and one of them was this Tarr. But there is no doubt about this one - it has the Tarr stamp on top of the back, it is signed on the inside of the belly and has the words "Made by Willm Tarr, Manchester 1847, no 134" on the back. 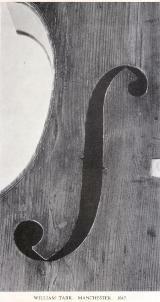 There are photos of it in the Grove Dictionary - the Grove contacted Elgar to ask if could reference his books and used some of the prints for the Double Bass section, and he chose this one. I reluctantly sold the bass in 2010 - it has gone to a new home in Holland, I think. I hope the new owner has as much fun with the bass as I did for 21 years.